YOU CAN HAVE AS MANY DEDICATED IP’s AS YOU WANT WITH 1 VPN ACCOUNT. PLEASE NOTE: DEDICATED IP COST IS $10 PER MONTH AND YOU WILL BE SENT A MONTHLY INVOICE TO CONTINUE WITH THE DEDICATED IP. Dedicated IPs are one of the unique features that you can use with TorGuard VPN. On the TorGuard store in the VPN checkout section, we let you add a dedicated IP add-on when you purchase your VPN subscription. While we offer shared VPN IP’s by default, dedicated IPs with TorGuard VPN have many special benefits and use cases. We’ve seen a huge increase of users who want a dedicated IP in the last few years as streaming services have grown. Normally, when you connect to TorGuard VPN through the client, you are using a shared anonymous IP address. This means that when torrenting, accessing the web, or using apps and services, you share an IP with other users that access the same IP pool. Shared IPs are great for anonymity, and this is why it’s default to use a shared IP address. You might be wondering, what is the difference between a shared IP and dedicated IP? As explained earlier, shared IPs are the default IP method used when using TorGuard VPN. However if you decide you want to use your own dedicated IP purchased through our checkout option, you can enjoy many special benefits and advantages that a dedicated IP has over a shared IP. However, there are also a few minor disadvantages that you should take note of. The main difference between a shared and dedicated IP is the anonymity factor. When you have a dedicated IP it’s easier to lock down your IP address if an app or service is trying to identify you. However, keep in mind all of your data is still encrypted. Your dedicated IP is different than your real IP, so even if someone finds your IP, it’s not giving any information about your real location or the data that was handled due to encryption. Your dedicated IP acts more just like an identifier, so a service can recognize you based on that IP–which in some ways, is why it’s advantageous as we’ll discuss later on. While shared IP addresses are better for security and anonymity, dedicated IPs are great for many use cases. When you purchase a dedicated IP, you get your own special IP address from our TorGuard team. This IP is unique to you, and it’s different than your normal IP. One of the biggest reasons we recommend a dedicated IP is to unblock and watch streaming services with TorGuard active. Without a dedicated IP, many popular streaming services like to block shared IP addresses and it’s easy to blacklist them. The reason is that with TorGuard, you can unblock geo-restrictions and access content worldwide. With a shared IP this is still possible in most cases, but with a dedicated IP, your IP is unique to you and not used by thousands of other users. This way, you can stream and watch content without worrying about interruptions that could be caused by services blocking our shared IPs. Ever logged into a video game service only to find yourself having to re-verify yourself? This could be due to the service knowing your real IP and when you try to log into the service with a different IP, your activity could be flagged which causes you to re-verify or even for your account to be temporarily locked. These security protocols are put into place to prevent account sharing or account theft. With a dedicated IP, your video game services will recognize you since you will always have the same IP in the future instead of different shared IPs. Similar to video game services like Battle.net or other gaming apps, online banking services tend to get suspicious when you use different IP addresses. Banking sites don’t want account theft either, and when you use different IPs, that shows the site that you might be logging in from an unsecure location or someone else might be trying to access your account. This means that you will have to go through more security questions and verifications, but if you use a dedicated IP, the website will soon recognize you and not cause you any extra hassle. One of the best ways to prevent un authorized access to sensitive systems is to “Whitelist” your dedicated VPN IP. In this way, the firewall will only allow a user to login if the IP matches a previously specified address. This is a great security option for locking down private servers, or remote access systems. Using a dedicated IP VPN with TorGuard is very simple once purchased as an add-on from checkout. Simply launch the TorGuard client, click “more settings” on the main app interface. Then from here, navigate to “Servers”. Enter in your dedicated IP address into the “IP Address” section, and then assign a “comment” or nickname that you like. Click add. Now, save. 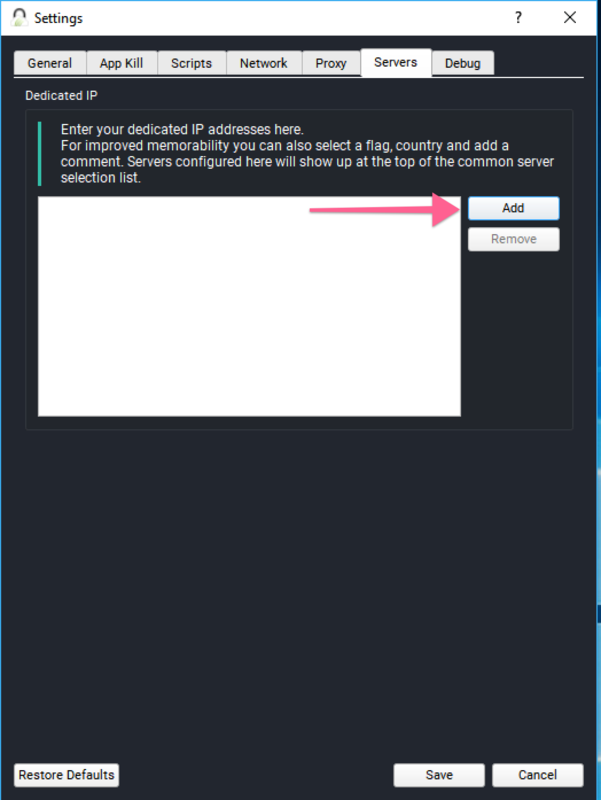 When you go back to the main interface of the client, you will find your dedicated IP within the server list, and you can even favorite it to make it easy to find in the future. Now, click connect and you’ll connect to the dedicated IP making streaming, playing video games, online banking, and other services that prefer unique IPs much better. TorGuard VPN is dedicated to its customers. It doesn’t matter if you are looking to overcome strict government imposed firewalls or web censorship, TorGuard will provide you open access to the web from anywhere in the world. When walls go up, TorGuard VPN finds a way to break them down so our clients can enjoy the full benefits of VPN service. The best and most reliable way to gain permanent access to ANY online service is to use a unique IP address, that is, a dedicated IP address that only you have access to. When an online service provider sees your new IP address, it will be unique to you, and it won’t raise any red flags in their system. Dedicated IP addresses are also invaluable for a multitude of things. Many gamers like to use dedicated IPs to host game servers on their machine. They are also valuable when using websites like PayPal or Gmail that like to see one IP address. Many game logins require additional information if you regularly change your IP address, and your online Bank might need you to re-verify yourself without a dedicated IP. Dedicated IP addresses make for the best-uninterrupted browsing experience when matched with a premium VPN service like TorGuard. We have recently updated the TorGuard VPN app to include convenient dedicated IP address integration. This makes it extremely easy to setup and save your dedicated IP address before connecting through a VPN. 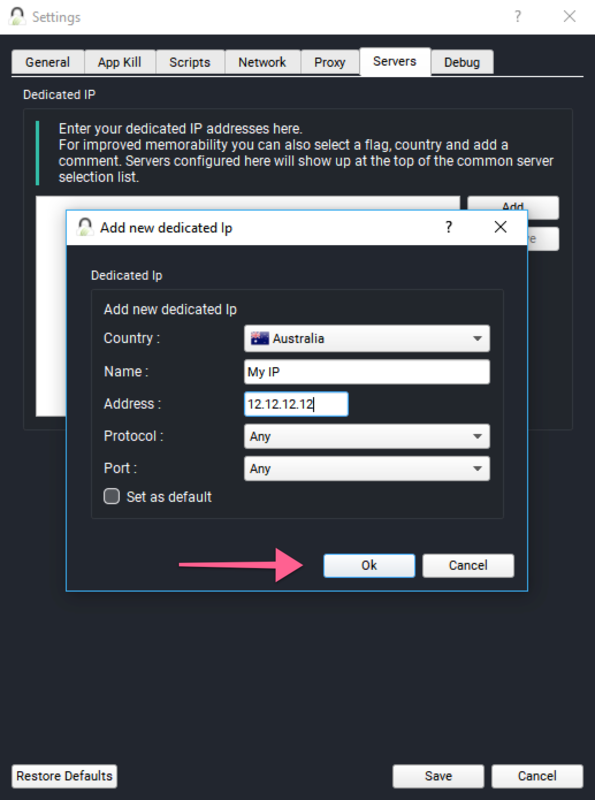 You can now save your favorite Dedicated IP locations right on the server menu and switch between a shared VPN IP and a dedicated VPN IP in a few clicks! To setup a Dedicated VPN IP just load up the client normally, navigate to “More Settings”, then click the rightmost tab “Servers”. Here you can add all of your dedicated IP’s and click save. Once you go to your location navigation at client start, you will see your new dedicated IP address at the top of the server list. You can also add more if you want to have multiple IP addresses.